Northern Dancer with E.P Taylor. He was the first Canadian-bred horse to ever win this prestigious race moving from being stuck on the rail in seventh place to grab the win by a long neck after making his bold move in the last turn. But this win was just the start to his meteoric rise to fame as a racehorse and a stud. The Dancer, as Canadians called him, was waltzing towards immortality at warp speed. His early race wins included the Summer Stakes and Coronation Futurity at Fort Erie racetrack in Canada with Canadian Ron Turcotte in the irons. He won seven out of nine starts, was named Canadian Juvenile Champion and people began to take notice of the small power packed horse. As a three-year-old his wins were coming fast and furious with American Bill Shoemaker as jockey and included the Grade 1 Flamingo Stakes and the Grade 1 Florida Derby. Shoemaker was asked to commit the upcoming Kentucky Derby ride to The Dancer but declined in favour of Hill Rise, a colt who he felt could win the Derby. Bill Hartack was then given the ride. But, Northern Dancer was, to the American racing blue bloods, not made of the right stuff for winning big on their turf. After all he was a short, stocky horse from a place called Oshawa, Ontario up in Canada where there was a General Motors plant; a far cry from the moneyed farms of Kentucky. Even his two minute dash for winning cash in the Derby wasn’t enough to silence the non-believers. Canada, 50 years ago was the quiet, rarely thought of country that lay north of The United States of America. Canada was small potatoes in the veggie patch and hadn’t yet developed the swagger, albeit the polite slightly self-deprecating swagger, that she possesses today. So, when racing fans took another look at this horse from Canada who was walking towards the starting gate at the Preakness, they put his impeccable breeding and Derby win aside and favoured other horses who looked like more likely winners. 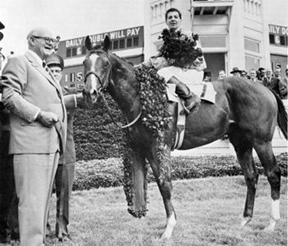 Northern Dancer’s ancestors had won such races as the Belmont Stakes and the Preakness besides the Epsom Derby but this meant little to the racing fans on Preakness Day in 1964. To many fans, Northern Dancer was just a lowly Canadian horse owned by portly Canadian business tycoon E.P. Taylor whose entrepreneurship turned small fledgling operations into profitable mega organizations. This control extended to his knowledge of horse breeding that created pride and profit when done properly. E.P Taylor knew his stuff as the naysayers were about to learn. The Dancer had power, personality and presence. Northern Dancer won the Preakness that day and the excitement that comes before a possible Triple Crown winner grabbed the attention of all, even those who didn’t follow racing, especially in Canada. However, a Triple Crown Canadian win was not to be when he came third in the Belmont. However, he did win the Queen’s Plate, Canada’s premier horse race, by seven and a half lengths soon after. An injury to a front tendon saw to his retirement as a racehorse but his second career as world class stud lasting until 1987 was no less spectacular. It started at Windfield’s Farm in Ontario until he was moved to Taylor’s Maryland operation in 1969 where he remained until his death. His sire and great sire Neartic and Nearco had passed along a streak of aggression to him which no doubt helped him win at the track but made him hard to deal with in the breeding shed. However, his offspring shared his determination to lead, and have won the Kentucky Derby, the Preakness and the Belmont. As a leading sire in 1971, Europeans began to take note and his high priced offspring were bought and sent overseas to continue his influence based on the Epsom Derby win by Nijinsky II, the English Triple Crown Winner in 1970. Charles Englehard was convinced that Northern Dancer would prove to be the world’s greatest sire and people like racehorse owner and businessman Robert Sangster, Stavros Niarchos and the Maktoum brothers of Dubai agreed and began buying horses sired by Northern Dancer. Between 1974 and 1988, 12 Northern Dancer yearlings were leaders by average price at the Keeneland July Selected Yearling Sale. In the 1980s his stud fee of $1 million was an amount that was four to five times that of his rivals and was not equalled until 2009. According to France Galop, since 1984 every Prix de l’Arc male winner’s bloodline can be traced back to Nearco, his son Nasrullah and finally to our Canadian star, Northern Dancer. Northern Dancer’s two minute Derby record win that showcased his incredible stamina was only bettered by the famous Secretariat who ran the race in 1:59.40, a track record for the 1 1/4 mile distance at Churchill Downs. If a horse in any discipline has great speed, stamina, longevity and vitality, chances are he is blessed with the large heart gene that was passed down a long, long line from the mare Pocahontos born in 1873. Northern Dancer was blessed with this large heart gene thanks to a Mahmoud, the Epsom Derby winner. Australian racehorse Phar Lap also possessed the large heart gene and the famous Secretariat also had the large heart gene from a horse called Princequillo who, it was discovered, had the largest heart of all. Northern Dancer can count many awards as his own. In 1965 he became the first horse to be entered in Canada’s Sports Hall of Fame, an honour he now holds with show jumper Big Ben, another Canadian equine icon. He won the American Eclipse Award as Three-Year Old Male Champion in 1964 and the Sovereign Award for Horse of the Year. 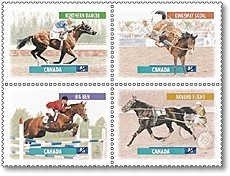 Northern Dancer is immortalized on a June 1999 stamp featuring Big Ben, Armbro Flight and Kingsway Skoal. He stayed at E.P Taylor’s Maryland Farm until his death and then his remains were brought back to Canada and buried at Windfield’s Farm in Oshawa. Sadly the farm has fallen into disrepair and his grave is no longer accessible to the public. The Windfield’s Farm website states that: He now rests only a few meters from Barn 6, where his legacy began. Windfield’s Farm and all the racehorses who came from there are part of Canadian history that must survive and should be preserved. But whatever happens to the physical buildings, paddocks and fields of Windfield’s Farm, Canadians will always remember a small horse they called The Dancer: He was a great horse, a racehorse, a super sire, but above all, he was ours! He sure was…a real Canadian Superstar! He got a dreadful ride in the Belmont, and I am convinced to this day that it that cost him the race. He was also running hurt. It makes you wonder, after two great races why he didn’t win the Belmont.Certainly adds weight to your comment…many thanks! i was born in 1960 in Oshawa, passed by the farm so many times growing up seeing the horses run on their property. I always smiled everytime how beautiful the horses looked. I am saddened today that won’t happen ever again. I hope the land devloper who has bulldozed all the land and is almost finished putting in the last tract of condos squeezed onto the property can at least put up a huge bronze statue of Dancer and put his grave under it out of respect.